You may have noticed a long silence here and I wouldn’t like to lay the blame at anyone’s door but mr tMatM was away for a week – and as it turns out, I really am not capable of both entertaining our 7, 5, 3 and 1 year olds for a week of summer holidays solo and writing a blog in the evenings, without having some kind of major existential crisis. But now he’s back, so I’m back too. Onwards and upwards. I have called this a side dish but I will be straight with you: this is the least sophisticated side dish you will ever encounter. Also worthy of note, calling it a side dish doesn’t mean that it hasn’t also featured as a main meal on a number of nights with a hungry and picky toddler at the table. What am I talking about? An absolute favourite around here: special Mash. 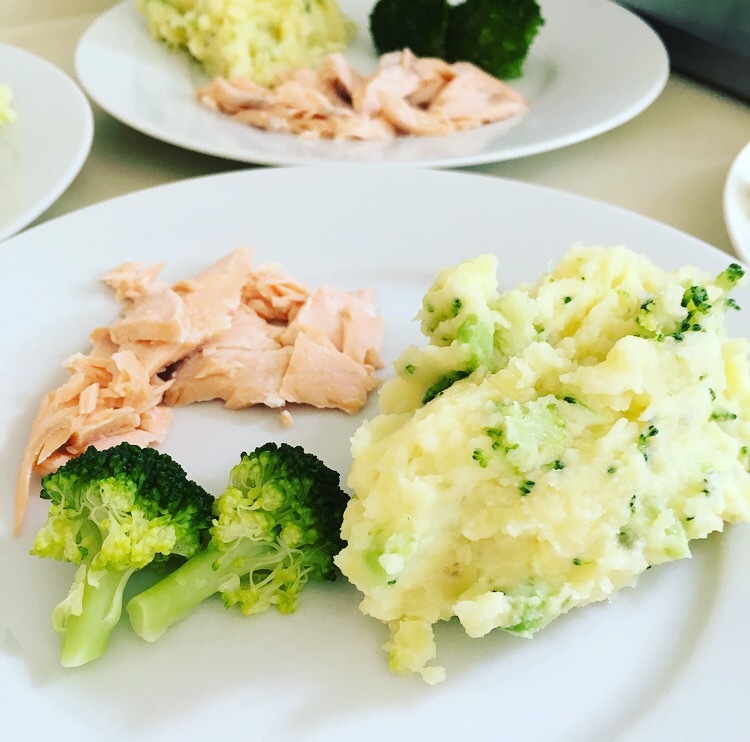 This is loosely based on an Annabel Karmel recipe but I’ve used it in various ways for 6 years and unless she has some kind of copyright on cheesy mashed potatoes then I think we’re in the clear to call this a mumandthemom recipe and not Annabel’s. This is an excellent one to have up your sleeve, ready in 20 minutes and with only a couple of minutes of preparation. 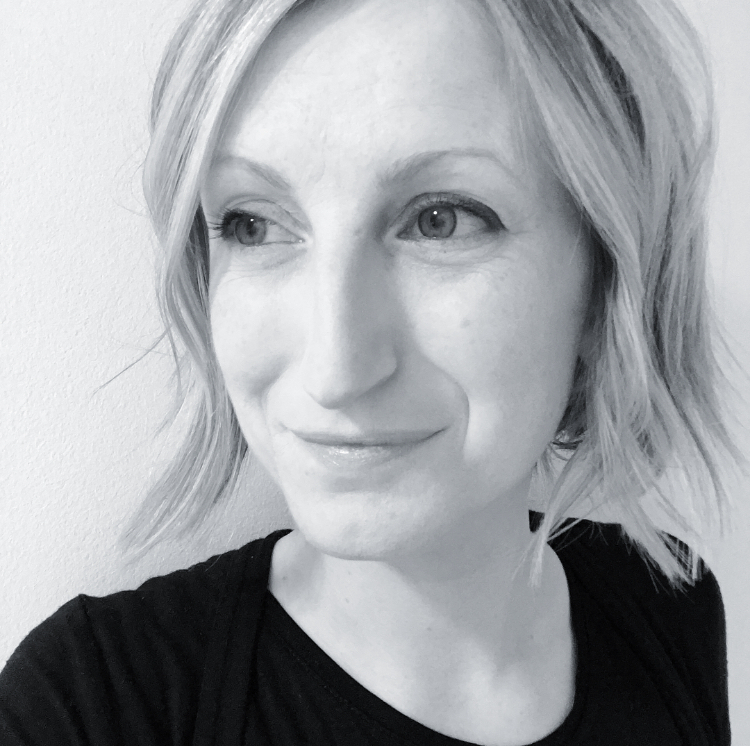 And, crucially – it can be made almost entirely one-handed, whilst holding a grumpy baby in your other arm (tried and tested, four times over). Which, now I think about it, may have to be the criteria for any recipe I truly endorse. The mashing of the potatoes may involve a baby carrier for a couple of minutes, or an episode of the Alphablocks, or maybe a quick toddler activity for a frustrated 1 year old. 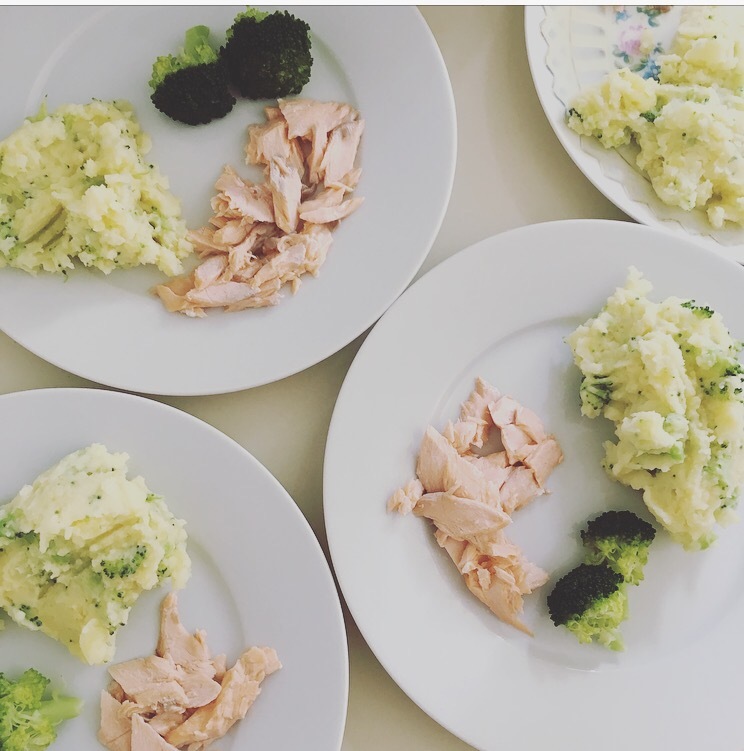 In any case, the best bit about this dish is that it will be enough for a newly-weaning baby’s full meal (in a separate bowl, made a little thinner with extra milk/breastmilk), or a side dish for an older child (it goes well with salmon or, dare I say it, fish fingers). The basic cheesy mash: peel, chop and boil potatoes until soft. Drain potatoes. Add a couple of handfuls of grated cheese (more if your children will go for it). A large-ish knob of butter (unsalted for younger ones, especially as the cheese has salt in it). Mash, with a splash or two of milk. 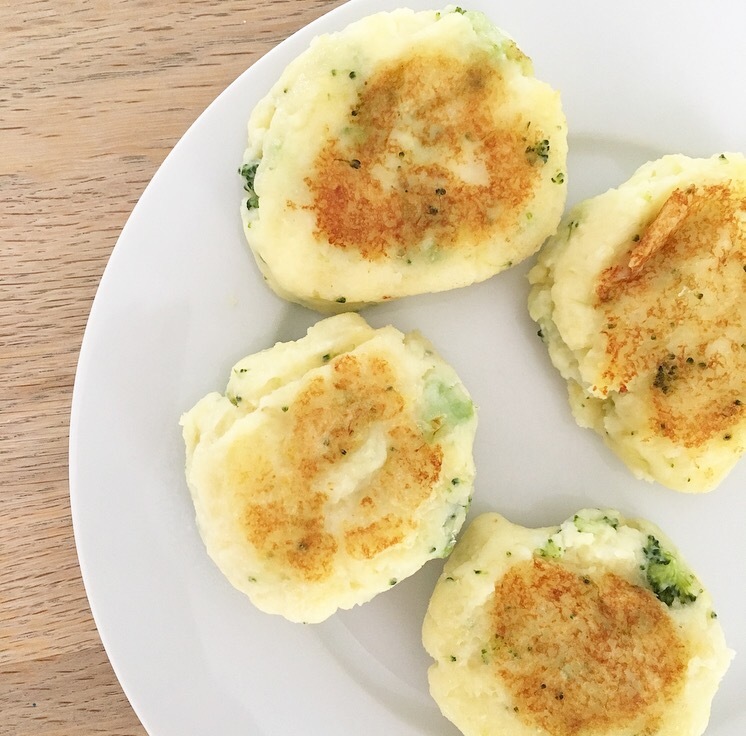 The special additions: Our favourite combination in this house is a simple cheese and broccoli mash (green mash, as my 3 year old calls it, but I’m not sure how appealing that sounds to a wider audience). 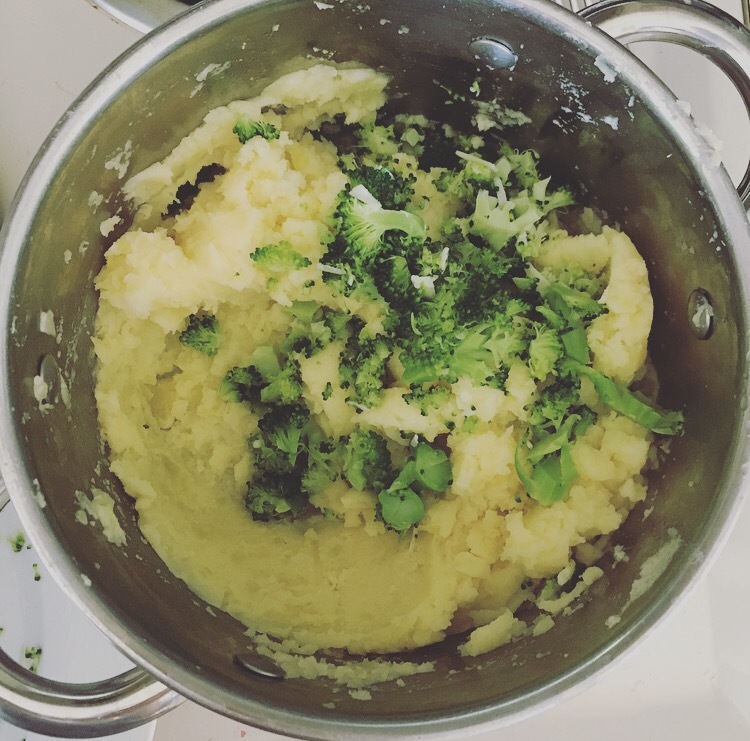 I throw a chopped head of broccoli into the potato pan about 4 minutes before the potatoes are done, drain, chop and mix through the mash. The finer the chopped broccoli the better. Other ideas: Annabel includes cheese, broccoli and skinned tomato, I think (a bit too labour intensive in my mind). We sometimes add corn; grated and softened courgette; mashed sweet potato or carrots; spinach. 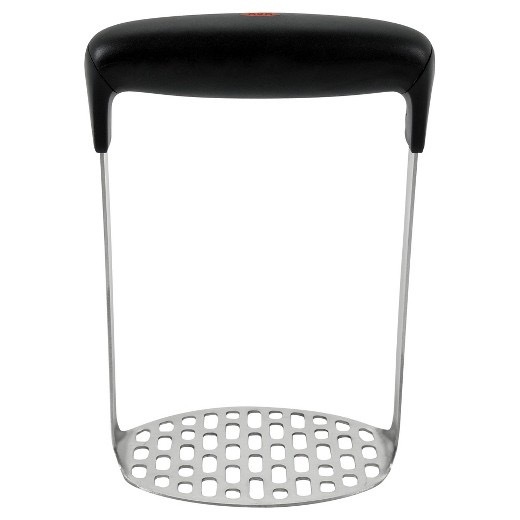 Essentially, any mild vegetable that goes well with cheese will work nicely here and often you’ll find that a vegetable normally rejected is suddenly accepted. The extra smug: The best thing about this is that a little effort goes a long way. I normally make this as a side dish but make twice as much as I need. Then the following day, you can make these into delicious potato cakes (or ‘mash browns’, our sophisticated name for them). If you have any leftover salmon you can also mix that in to make a rudimentary fish cake. These are exceptionally easy: I put a teaspoon of oil in a flat frying pan on a medium heat, pile a spoonful of the mash at a time into the pan and let brown for 1-2minutes on each side. These will be softer than usual potato cakes. 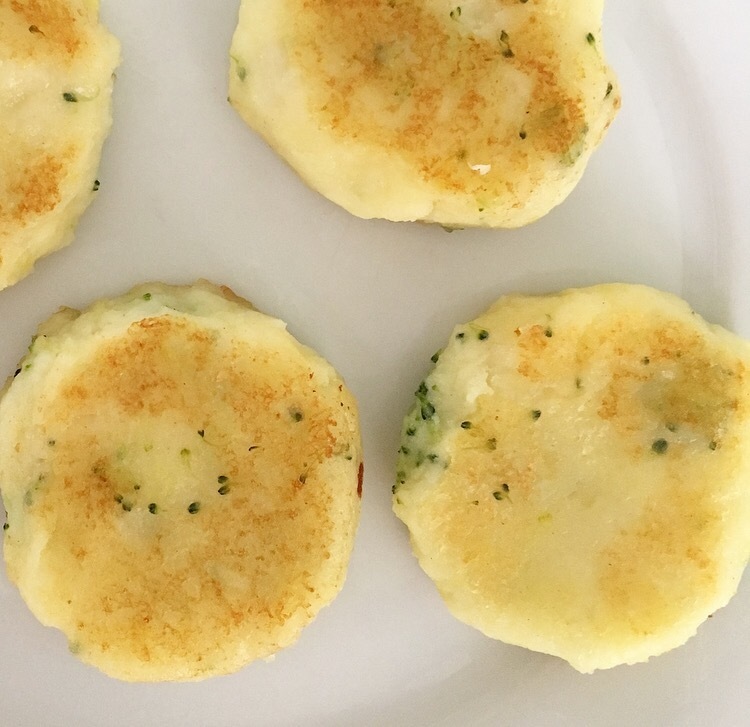 If you would like to make potato cakes that are a little more traditionally firm – then I add a spoon or two of plain flour, depending on how much mash I have leftover – and the quantities are really pretty forgiving in both directions. I mix the flour through, roll the mix out on a floured surface, and either cut into triangles or rounds (or both, on spec that one of those shapes will be outright rejected). If you want extra firm potato cakes you can dust them in a little egg and more flour before gently frying (1-2 mins on each side) but I tend to skip that step in the interests of keeping it simple. For an older child who has tasted a real hash brown and needs persuading that this is a treat, they are pretty conducive to a scattering of salt and a little bit of ketchup. For the under 3s, these are a total treat as is. Pop a poached egg on the top and you e got yourself a pretty good toddler lunch. Normal service to resume now with a husband back in situ. Thanks for bearing with me. Way to go on the variations here! Something for everyone, Now if I could get my kids to like mashed potatoes ;). Ahhhh simple and great! I tend to forget about mashed potatoes but will give this a go tonight.